Northern Lights Travel Blog #4 - Dreams are what you wake up from. I woke up at 430am, the likely effects of my jet-lag. I moved in and out of slumber until it was time to get up. to the pavement to wait for the car rental pick up. It would be a start of another long day. At RED Car Rentals, we received our car. It was a silver Hyundai iX35, a SUV with a four wheel drive. while M fiddled with the provided Garmin GPS. 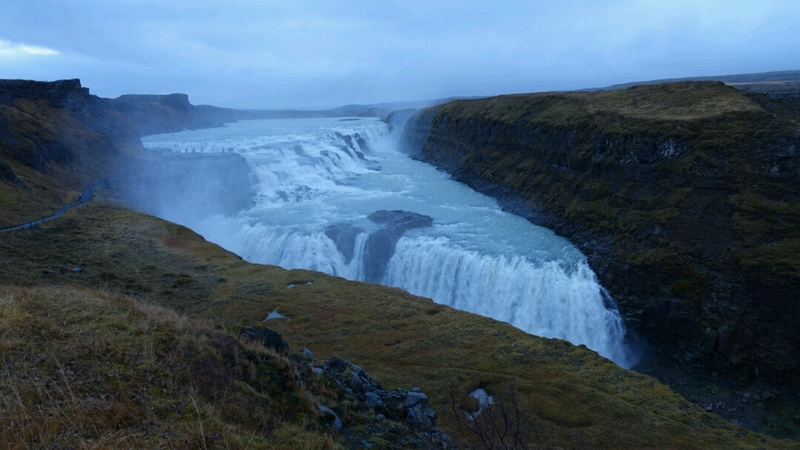 where we would be doing the dry suit diving at the Silfra River. As it was a Sunday morning, the city was still asleep as we drove out of the city. After about an hour, we saw the massive rifts that marked the North American plate from the Eurasian one. A-levels geography plate tectonics lessons. This also marked the first of several mishaps we would have with the Garmin GPS. The GPS couldn't accurately pinpoint the destination where we were supposed to meet with the diving organisers. Perhaps the location was not a significant one, hence the GPS had no proper record of it. We decided to find some trace of civilization so that we could stop by to ask for directions. Getting our bearings right, we decided to make a quick half-hour stop at Pingvellir. I would later on by touching both plates in Silfra. Pingvellir was also the seat of the first parliament in Iceland. fundamental aspects of wearing and controlling the buoyancy of a dry suit. There was a surprisingly large group of participants for both the snorkeling and the diving tour. Our group consisted of five persons and two instructors. The other three participants including two other Singaporeans. and the guy made a trip from Singapore to UK to visit her. There was another American guy that joined the group. 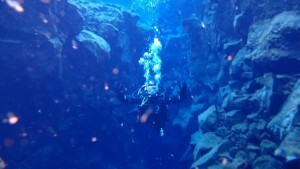 The diving tour consisted of two rounds along the Silfra River. 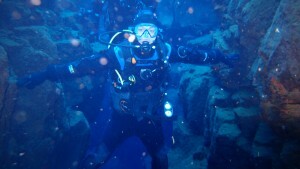 The first one was mainly for practice and for us to get used the dry suit buoyancy. The second session would be a "free and easy" leg. "You can then bring along your camera for photo-taking if you wish," the instructor advised. for this diving, we had to walk some distance with our gear and steel air tank. Definitely heavier than the usual diving gear. One by one we then descended into the cold waters. I peered into the water via my mask, and was immediately amazed by the clarity of the waters. There were no visibility issues, and I could easily look into the distance. This must be one of the amazing experiences of the trip! but one would have able to physically touch both tectonic plates on the water. For our second round, only three of the five repeated the course. he might develop leg cramps if he continued with round two. The other Singaporean girl had water seeping into her dry suit and felt too cold to carry on. I thus took the Olympus camera and its underwater case from M.
This turned out to be an exhilarating experience, as I was able to snap away like a trigger-happy underwater pirate. I was virtually taking random shots of everything! the Advanced PADI, was to prepare for this diving experience. that I should experience life in its plethora of colored hues. Yeah! It was getting quite late after the diving experience, and we had to get on our way. We had two more stops before checking into the next accommodation. The next stop would be the Geyser area at Geysir. The geyser has a habit of spurting every 8 to 10 minutes. I was bewildered to find so many Asian tourists at Geysir. who wanted an off the beaten path experience. this wet of geysers. In fact. Geysir or Geyser was actually an Icelandic terminology. And then we hurried away. This magnificent waterfall was situated only several kilometers away from Geysir. so we had to hurry over to the waterfall for a few quick shots. where we were supposed to meet the diving operator. This problem repeated itself as we tried to find our next hotel. the Garmin GPS guided us back to Reykjavik instead. I was already driving in the night, taking extra caution. which was easily 90km away from Selfoss. readjusted the Garmin towards the right direction. By the time we arrived at Guesthouse Vatnsholt, it was past ten at night. We quickly checked in and like the night before, succumbed to jet-lag.